Are you looking for an Invitation Card Maker app to create beautiful Invitations / ecards with minimum effort? If Yes, then this is the end of your search. The next-gen Digital Invitation Card Maker is here. 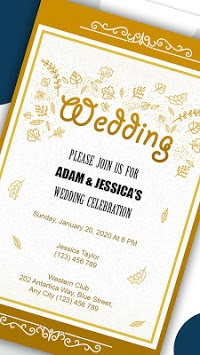 Create professional Digital Invitation Cards / Invites for every occasion using hand crafted Templates or use our Automated Invitation Card Maker tool i.e. Designer. 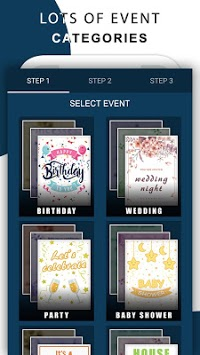 Invitation Card Maker gives you multiple options to create your personalized Invitation Card. 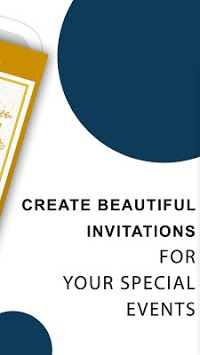 A fast and easy to use Invitation Card Maker tool to create amazing invitations in seconds. Just enter some information about the event and ready to use Invitation Cards are created in no time which you can further edit if you want or share as it is. Hand Crafted pre-build Templates to create custom invitation cards. Just select invitation card design you like, edit information about the event and your invitation card is ready to share. Convert your ideas in Invitations using Stickers, Text, Backgrounds and Images. Create beautiful invitation cards for every occasions like Wedding, Engagement, Baby Shower, Birthday Party, House-warming Party, Graduation Party etc. and invite your friends and family by sending invitation cards RSVP via Email or any other social networking platform directly from the app. 1. Beautiful HD Background Collection. 2. Various artistic Texture Collection. 3. Option to choose color as background. 4. Option to use own images from gallery as background. 5. Multiple aspect ratio for invitation cards. 6. Occasion wise categorized sticker collection. 7. Write text with multiple professional fonts & colors. 8. Add own images on card from gallery or camera. - Save your Invitation Cards and share on any social networking platform directly from the app.